If true, you know where to find me. I’ll be out of here by January 30. 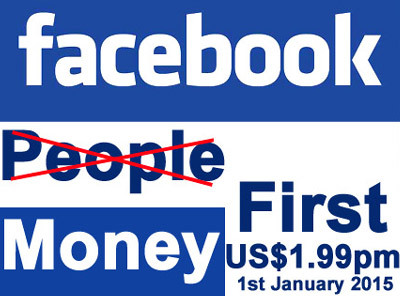 The New Year gift from FaceBook:- From January 1st of 2015, Facebook will start to charge it’s users US$1.99 per month to continue using World’s most popular social media platform. Mark Zuckerberg had originally planned on making Facebook a pay service by late 2014, but decided to keep the service free for the holidays, through the Christmas season. If any current facebook user refuse to pay the new monthly Facebook fee US$1.99 will have their account terminated and their content permanently deleted after 30 days. We’ll soon find out if this is true or just a rumor. If it’s true, Hasta la vista, baby! I never loved you anyway.